Zebrafish aren't just surrounded by liquid, but turn liquid—in part—during their development. As the zebrafish embryo develops from a ball of cells to a fully-formed fish, a region of the embryo switches its phase from viscous to liquid in a process known as fluidity transition. Such fluidity transition has long been speculated to exist in living matter, but is described for the first time to occur in a living organism in a study published today in Nature Cell Biology. The study was carried out by the group of Carl-Philipp Heisenberg at the Institute of Science and Technology Austria, with first author and Postdoc Nicoletta Petridou, together with the groups of Guillaume Salbreux at The Francis Crick Institute and Edouard Hannezo, also at IST Austria. Zebrafish are particularly suited for studying animal development as the embryo is transparent and develops outside the mother. At the very beginning of zebrafish development, a tissue layer, the so-called blastoderm, spreads over the yolk. The blastoderm changes shape to form a dome, hence this process is known as 'doming.' In the study, Petridou et al. investigated the mechanical forces at play during this shape change. By applying pressure to embryonic tissue through a pipette and measuring how fast it deforms, the researchers could infer how viscous or fluid the tissue is: tissue that deforms slowly is more viscous/less fluid than tissue that deforms quickly. Repeating the experiment at several time points and regions in the developing embryo, the researchers found that during doming, the tissue suddenly fluidizes at a very specific time and tissue region. "Such a fluidity transition was predicted to happen by theory and models, but here we show for the first time that it happens in a real, living organism," says first author Nicoletta Petridou. Why and how does zebrafish tissue become liquid? In "normal" viscous tissue, the cells are in close contact with each other. The authors found that the fluidity transition happens because cells keep on dividing during development. During division, the cells become round and detach from their neighbors. The more the cells divide, the more connections are lost between them, until they eventually lose so many contacts that the tissue turns liquid. "This is a mechanical and not biochemical change," explains Petridou, "The embryo is programmed to divide, it cannot escape it." All cells in the embryo divide, however, and the researchers observed that only a very specific region of the tissue, the central region of the blastoderm, became fluid. They then looked for a process that would prevent other areas of the embryo from turning fluid. A certain signaling pathway—the non-canonical Wnt signaling pathway—stopped the fluidity change at the margins of the embryo, says Petridou. 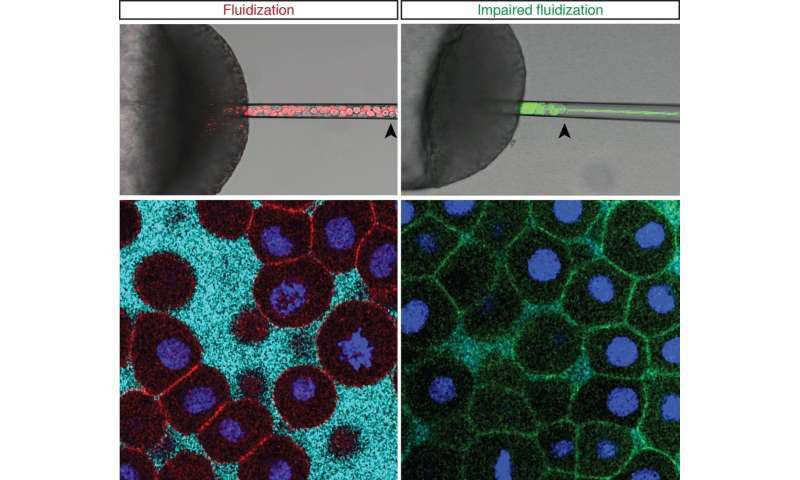 "Non-canonical Wnt signaling keeps cells connected and allows the embryo margins to bypass fluidization. We think that the default of the tissue is to become fluid, but the signaling keeps specific areas from turning fluid." When the fluidity transition goes wrong—either because the researchers stopped Wnt signaling so that all areas of the blastoderm become fluid, or because they inhibited fluidization in the entire blastoderm—doming is impaired and the embryo progresses more slowly during early development. "Our study shows that regulated changes in tissue material properties play an important and significant role in morphogenesis," summarizes Petridou. But the authors might also have found first signs of a well-known concept of physics happening in a living organism. The very sudden transition from viscous to fluid in the blastoderm resembles the phase transition. "Phase transitions, such as when water boils, happen suddenly. We called the phenomenon observed in zebrafish 'fluidity transition' as we are not certain that it is, in fact, a phase transition in the true sense of physics," explains Petridou, "However, we are working further to define whether this is a phase transition. Phase transitions can happen in molecular networks, but we don't yet know if they can happen in tissue or in an embryo."